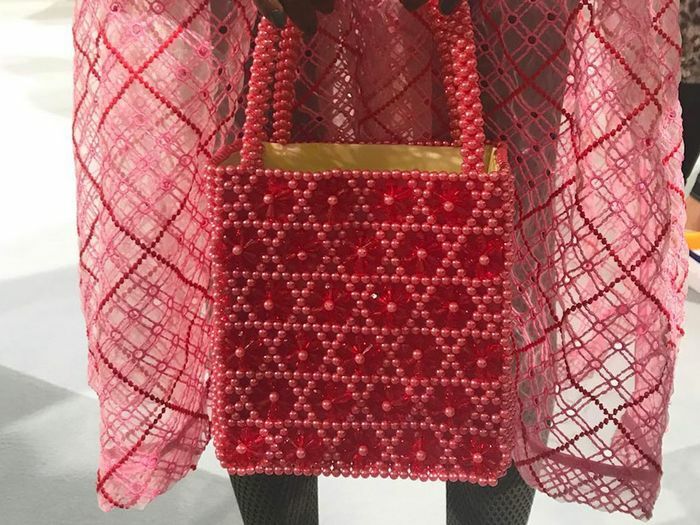 If there was one bag at Fashion Week with a huge presence, it was Chloé’s Drew purse. The curved satchel featuring major hardware was spotted adorning the arms of front- row regulars from Caroline Issa and Yasmin Sewell to bloggers like Leandra Medine and Aimee Song. In other words, this bag is getting around. We don’t remember a bag having such a moment since the Celine Luggage series exploded on the scene. Scroll down to check out the new bag of the moment, and let us know in the comments if you’d ever splurge on one! On Camille Charriere: Ganni top and coat; Reiss skirt; Hogan shoes; Mykita for Maison Martin Margiela sunglasses. On Zahra Lyla: Lovers + Friends jacket; Stella Jean skirt; Mango top. On Ella Catliff: Chloé Printed Silk Blouse ($1,050) and A-line Skirt ($753) in Black; Isabel Marant Pealman Bow Pumps ($708) in Black. Pictured: Aurélie Bidmann Gold Small Lace Cuff ($755), Gold Braided Cuff ($420) and Monteroso Wrap-Around Ring ($240). On Aimee Song: Givenchy vest; findersKEEPERS skirt; Giuseppe Zanotti Coline Snake-effect Metal and Suede Sandals ($1,871); Thierry Lasry Lively Sunglasses ($435). On Caroline Issa: Louis Vuitton Eternal Half Boots ($1,920). On Mary Orton: Milly Striped Maxi Skirt ($551) in Black and White; Rebecca Minkoff Tiffany Leather Tuxedo Vest ($261); Selin Kent Nico Ring ($205) and Ella Paveé Ring ($860). On Leandra Medine: Acne jacket; Rosie Assoulin top; Stella McCartney skirt. On Elena Perminova: Chloé Wool-blend Sweater Dress ($1,250) and Leather and Suede Over-the-Knee Boots ($1,544) in Mint Green and Grey. On Aimee Song: Chloe Sweater, skirt, and shoes; Oliver Peoples Leiana Flash Mirror Sunglasses ($405). On Kristina Bazan: Chloé coat and dress; Christian Louboutin heels; Eugenia Kim crown. On Aimee Song: Express Barcelona Cami ($45) in True White; J Brand Mid Rise Deconstructed Crop Jeans ($238) in Fury. On Anya Ziourova: Undefeated Sweater. On Margaret Zhang: Zimmerman Off The Shoulder Top ($785) in Black; Citizens of Humanity Corey Slouchy Slim Boyfriend ($248) in Bourbon. 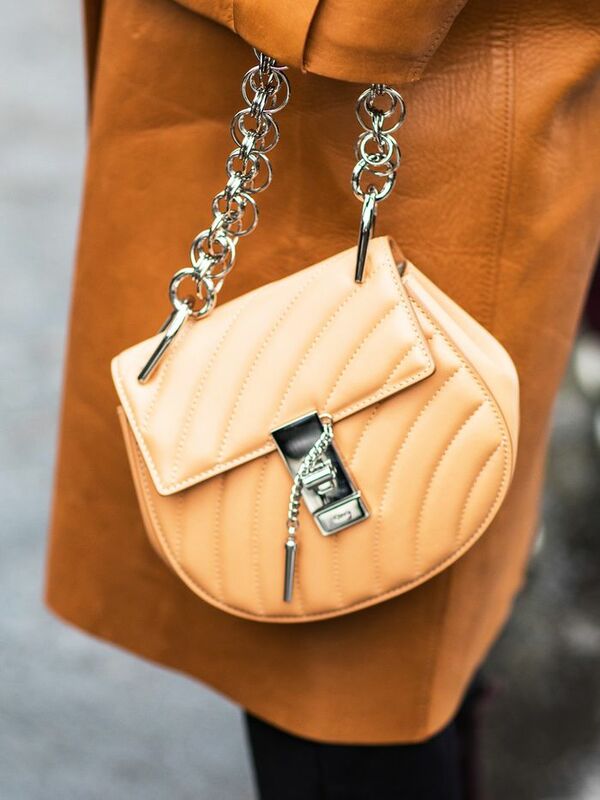 Feeling like you need a new bag after this slideshow? Us too. Luckily, we're giving away a Celine bag. Enter now and good luck!